We pride ourselves on having a "nail gang" that is made up of only the very best. You might think of fine jewellery when you hear talk of 24-karat gold and diamonds, but not anymore! Thanks to our super-indulgent services menu you can extend the wearing of your precious metals, diamonds and gemstones to your fingertips. 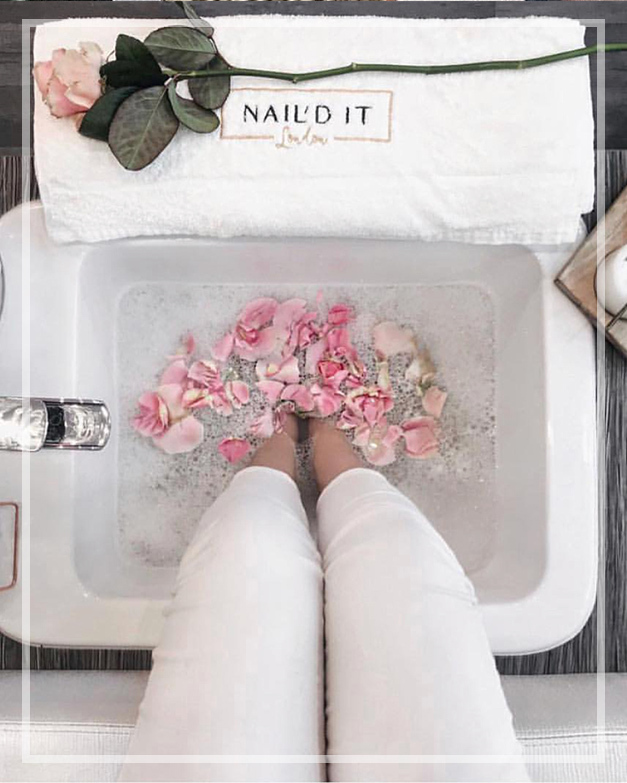 We have a luxe selection of treatments incorporating all of the above into what might be the most decadent mani or pedi you have ever seen. Pop the cork and celebrate your...hands and feet! There's a new ingredient fighting age spots and exfoliating your hands and tootsies: Champagne! Your feet will be soaked in a bath of fresh rose petals and minerals then showered with Laurent Perrier rose bubbles. You will have two nail technicians look after you simultaneously massaging in champagne oil (this is high in antioxidants, and it helps activate the grape peel scrub that will later be used), which makes the skin glow. The tiny bubbles in the champagne work as a natural exfoliant during the pedicure and also improve blood circulation. This is then followed by grape seed scrub to exfoliate all the calluses and dead skin. Champagne oil (grape seed oil) is used for massaging the legs and feet after the regular routine of trimming cuticles and cleaning and shaping nails. The champagne oil massage hydrates the feet perfectly after the exfoliation. Why settle for regular pedicures when you can have the champagne of pedicures - quite literally! Experience the ultimate in luxury hand and foot skincare with a rejuvenating 24 karat gold mask that calms and soothes the complexion, restoring nutrients and radiance for glowing soft skin. Give your skin a deep clean with a treatment that contains 24-karat gold to create a glowing, radiant complexion as well as delivering a huge range of skincare benefits. This is the ultimate hydrating treatment; restoring vital moisture to leave your hands and feet not only feeling, but looking fantastic. Deeply nourishing, the formula stimulates cell renewal and boosts blood circulation to brighten the complexion and balance skin tone. Gold is known for slowing down the collagen depletion and increasing skin's elasticity, while also stimulating the cells to make the skin feel firm and prevent premature ageing (including wrinkles) in the hands and feet. Leave with healthy, purified skin that seems lit from within. Ice Queen dream 'fire and ice"
Whether you prefer the warmth of a crackling fire or the refreshing tingle of winter's frosty air we have combined them together and created a sensation that is twice as nice and will literally blow you away. 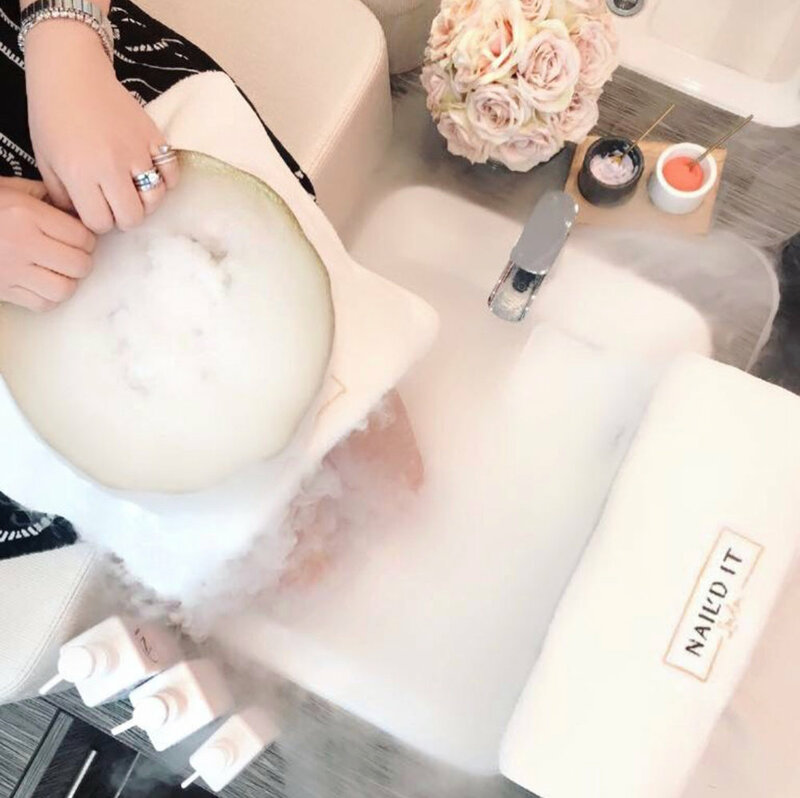 Sit back, relax and watch the magic happen; soak your feet in a mix of minerals to hydrate the feet and a magical mist will appear with our secret ingredients . A bed of ice is placed at the bottom of your foot bath to help to boost blood circulation and then a warm and soothing mask is applied. This is the perfect treat for puffy skin or bloated feet. This treatment is fantastic to soften and brighten the skin.